dejiolaluweblog: Opinion: Gernot Rohr: Off To A Roaring Start! 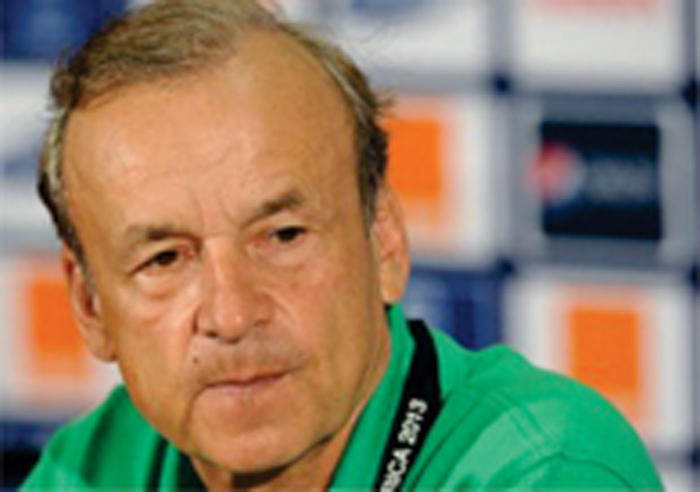 0 Opinion: Gernot Rohr: Off To A Roaring Start! In the process of selecting the Coach of the Nigeria national male football team, the Super Eagles, shortlyafter the unceremonious departure of the temperamental and no nonsense Sunday Oliseh, not many Nigerians give the applicant Gernot Rohr, the heck chance of a pick from the few names that were then being bandied in the media. that of the well traveled Claude Le Roy, Henry Michel and the very successful Herve Renard, who won the nations cup with the Zambia and Ivory Coast national teams were frequently mentioned. And ordinarily no one could have envisage the likelihood of a Rohr emerging as the pick out of these heavyweights at the end of the day. Having said that, it must be remember also that it is always no easy task where hiring a coach for the national team is concerned. This time around it was no different as there was the usual exchanges of heated argumentative ping pong between those who align with the idea of hiring a foreign coach and those who are opposed to it.. But thankfully the football authorities have made it clear early that it was going foreign after the acrimonious exit of Sunday Oliseh, an ex-international. In any case, many still were not expecting the German tactician to get the tick considering the list cited above tentative at it were. As such when he was eventually announced as the substantive manager of the Super Eagles hell literarily was let loose.The football house was accused of taking a costly gamble with their choice of a managerial nondescript for the Eagles when it could have gone for one of the marquee candidates. They insist anything what doing at all is what doing well and the task of hiring a coach for Eagles is one spectacular example. Questions were raised and rightly so concerning his managerial pedigree, his man management skills and quality of his technical know-how concluding rather prejudicialy that he is destined for failure. The coaching responsibility giving to him they think is way beyond his capacity and experience. And from what they could see he is no better than any of our local coaches. And in the midst of the crisis of confidence his appointment throws up a sizable number of pundits came to his stout defense. These were the optimistic chatter boxes of an ever believing group who think the new man at the helms of affairs of our national team will be a great success. Because, one, he is a foreigner who will not be interested in our petty, ever divisive ethno-political hegemonic rivalries or tendencies if you like. Two, who, like many of his forerunners, will be respected by default both by the officials and players alike. Three, as is tradition, whenever a foreign manager is in charge they also foresee the dawning of an era of discipline returning to the team. All these put together, they believe, are factors that will work to his advantage. Not leaving out the genuine supports of all and sundry; and particularly the Nigerian politburo which we all know pays the pipers; and to all good intent and purposes see football as a great PR tool which must be fully exploited. So far, whatever is the reason for their infectious optimism, they have been largely vindicated. so far not made any direct or veiled reference to building a new team as was the practice before now. Instead, he has simply went to work with the sole aim of delivering on his job in the most professional manner. And available statistics are proof enough of his Germanic thoroughness and dedication to duty and mandate of his contract. Indeed, it would be an overstatement to say he has made a flying start to his managerial career with the Super Eagles despite the cloud of doubts threateningly hanging over him nay his surprise appointment at the out set. In so short a time, almost every one now seems to agrees with as little or no debate that he has built a team with un-shaking belief and fighting spirit capable of marching on to eminent successes on the field of play in the frame, certainly, of the much beloved Clemence Westerhof's tutored golden generation of the 90s. Evidently, the nucleus of Gernot Rohr's team is youth which is no brainer with a moderate sprinkling of relatively ageing players to augment for experience and stability going into the future. Though like we say in the academia that examination is never a true test of knowledge but rather an indispensable tool for gauging the cognitive progress of students, Coach Gernot Rohr in this regards has demonstrated his ability to master the psychology of the Nigerian players and their responses to his managerial stimuli has been overwhelmingly great. No one is saying that result will always be excellent. We all expect that at some point in his managerial career thing may not always go our way because dynamics do always changed. But going by the gallantry exhibited against Zambia and Algeria, It is clear to all now that there is unity, purpose, team spirit, direction and focused in the team under his able watch. So far, he has faced three litmus tests of which two were crucial to Russia 2018 world cup, the results as we know it has been three over three. And Nigerians are beginning to belief too. Something which has not happened in a long time now. Their enchanted voices can now be heard deafeningly over and above the rooftops. This is something typical of Nigerian football supporters when they are served something as sumptuous as what was on display both in Lusaka and the nest of champions. For this, Coach Gernot Rohr has proved he is the man for the job and the hour and capably too. Believe me people the team can only grow in leap and bounds with the unflinching supports of all relevant stakeholders. And what a ride it promises to be for a long time to come! Though some would caution that It is still early days and that we should be careful not to create unrealistic expectations. While many more would argue that there is a certain magical aura around Eagles of the 90s which made them to soar so high to the fifth position in the world ranking; and doubt whether the present crop of players can achieve that any time soon if at all. Nevertheless, like many people, I have every cause to believe the German born Coach like the Lord of the jungle is definitely off to a roaring start managing the Nigerian national team. And I can see a glorious dawn beckoning yet again with the team. Labels: Opinion, Opinion: Gernot Rohr: Off To A Roaring Start!